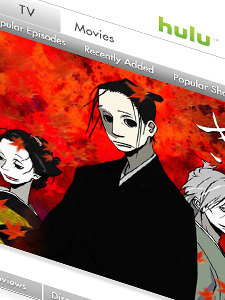 Hulu has lots of things on it, that you can watch. Like House of Five Leaves. You should watch that. It's pretty great. What’s this?! A new podcast? INDEED IT IS! And lo and behold, it’s another roundtable episode! We had some really good feedback the last time we did it, so we’ve decided to keep doing them whenever we think up a topic we can round about at a table. This time, we talk about Online or Internet TV, specifically online streaming for the most part. Okay so sometimes it’s every other other week. It happens! Maybe next time we won’t try and cram two cons in a month… No we probably will! Especially when they are as fun as HamaCon and SeishunCon. See it's from a webcomic and it has a round table! That's COMEDY! In this episode we try something new and exciting! 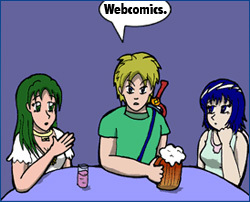 In this episode Eric, Sooz, Lee, and Mysterious Racer X talk about webcomics. The Whats, Hows, Whys, all that jazz! Or perhaps not. The only way to find out, however, is to listen! I stole Lee’s image Promo Link: HAZARD’S WAKE! It is a comic. That Lee does. It makes RPG jokes. Usually they are pretty good ones. You should read it. And laugh. I stole Sooz’s image last time Promo Link: Reliquary! This is also a comic. That Sooz does. It tends to not make RPG jokes. You should read this too. So in lieu of these exciting experimental times, you should also break tradition and tell us what you think! Comment! Email! Call! Although as we said in the opening bit, the first 14 minutes will be somewhat choppy, but totally listen-able. SO LISTEN.